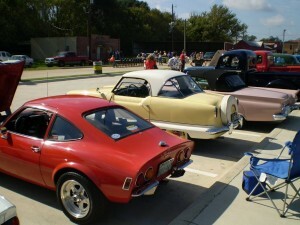 The 4th Annual Fire Brigade Benefit Classic Car Show in Jefferson Texas, Saturday September 8, 2012. Registration begins at 10 a.m. Awards will be held at 3 p.m. The day will be filled with drawings, an auction, and 24 trophies will be presented in 12 classes. Jefferson Transportation & Visitor Center Parking Lot at the east end of Austin St will be sporting some mighty fine classic cars. There may be cars from the late 1940’s to the 1970’s ranging anywhere from stock to modified and some under construction models and maybe even a Street Rod or two. $20 Pre-Registration-$25 Day of Show For more information call 903-742-9449 or 903-665-9900. This Classic Car Show benefits our local Volunteer Fire Department. Please come out to the event to feast your eyes on some beautiful cars and help out if you can. Even if you can’t be here please support your local firefighters. This entry was posted in Fall Events by Tammy D. Bookmark the permalink.